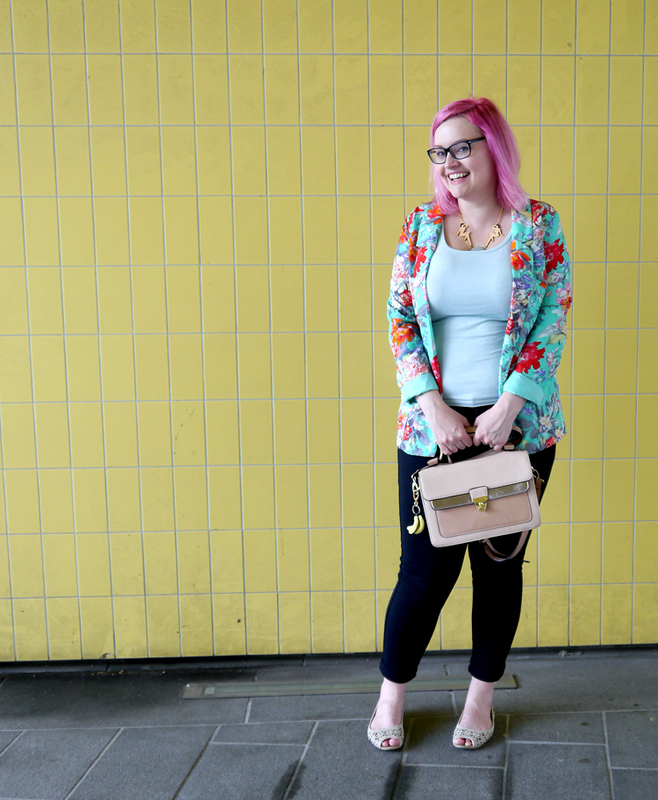 I was surprised when Helen said she didn't have many tropical outfits- she always seems so colourful. I guess she does wear a lot of block colours. 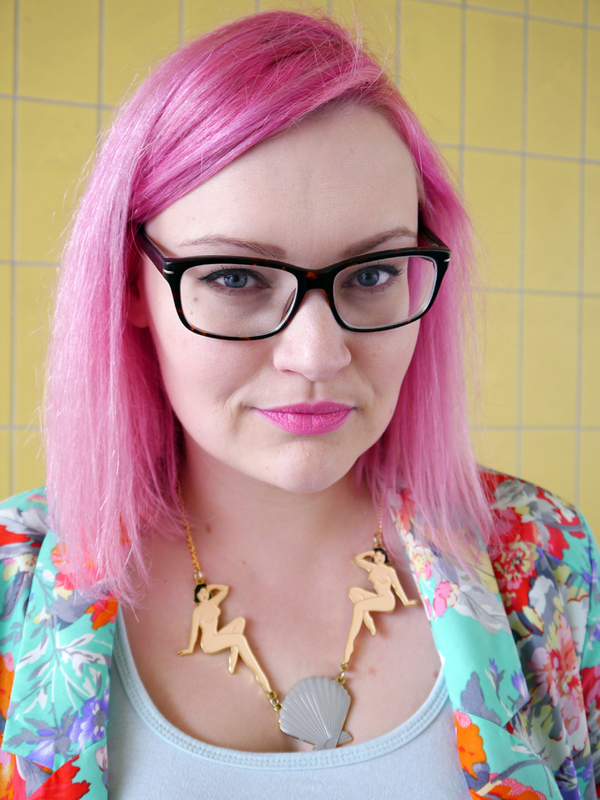 I, on the other hand, have loads of tropical homages, shirts, more shirts, skirts and dresses. 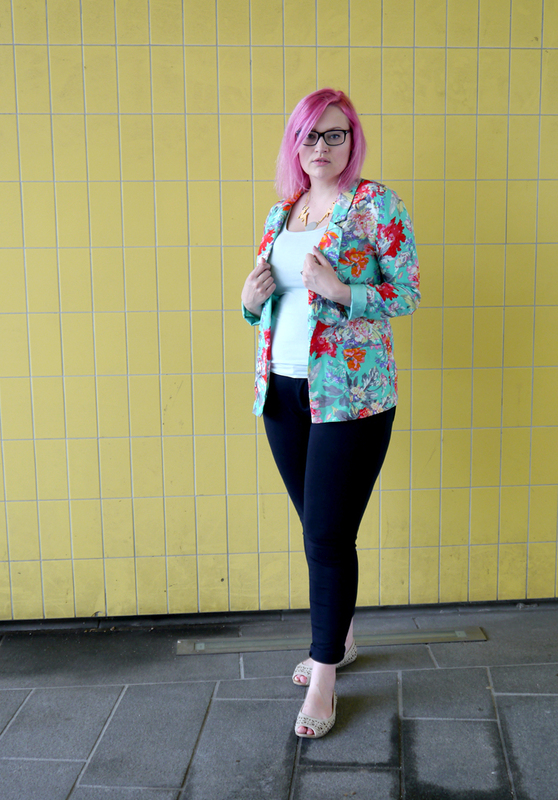 And this jacket, that I wore for a 'summer brights' photo shoot a year ago, so I guess I should get away with pulling it out again. Although it's a really fun print it feels a lot like a polyester shell suit and it is torture on a hot day- I worry that if I swing my arms too quickly I might ignite and set myself aflame. Luckily for me, I live in Edinburgh where we regularly have four seasons in an afternoon so it's not hot enough to cause me to combust. When I left my house for this shoot it was another sunny day. Fifteen minutes later it was a drizzly, mizzly mess and so was I. Never mind! 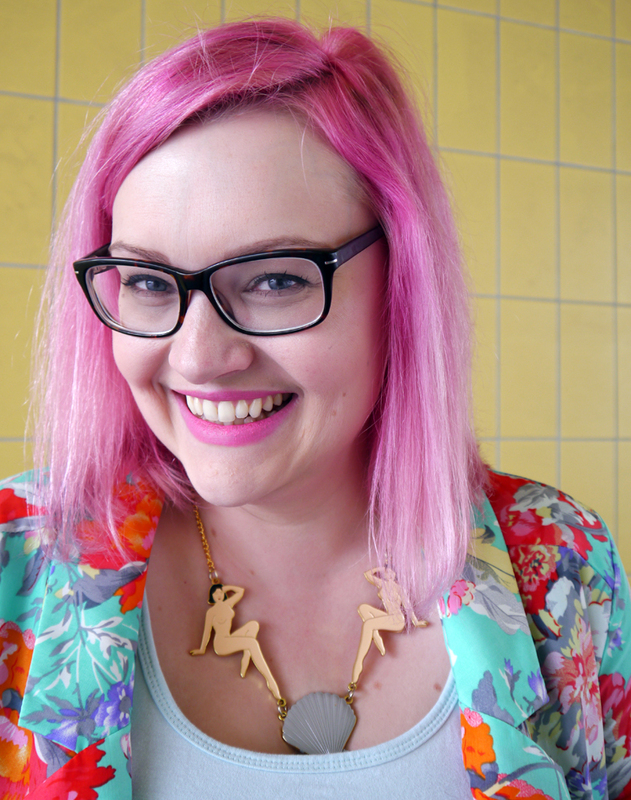 Apart from my hair being a little too candy floss like (frizzzz) it was all good. My photographer for the day was our main squeeze Miss Vicky Viola. We found a quiet little spot in my old haunt, the Dugald Stewart Building. I used to have lectures here ye know, young 'uns. 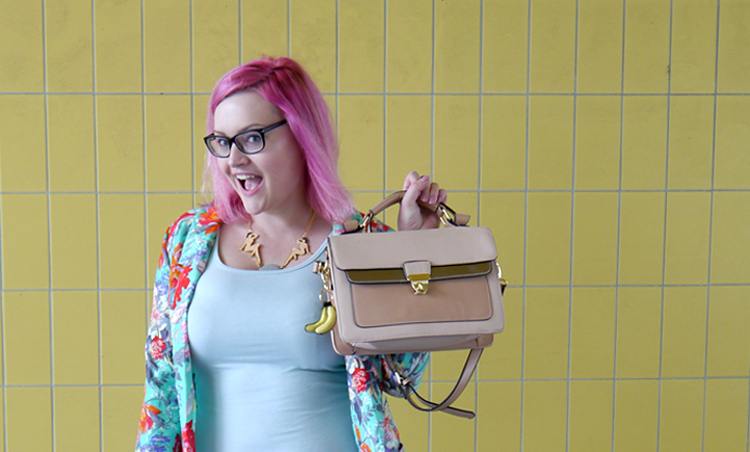 My favourite thing about this look are my accessories. 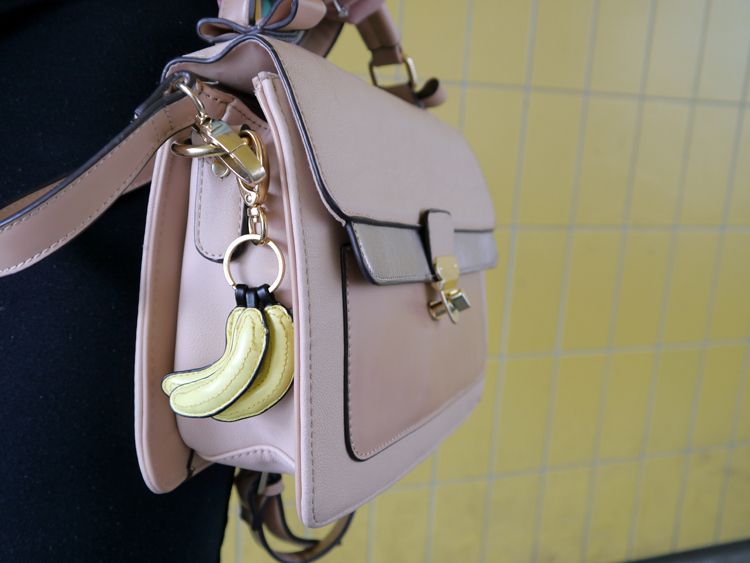 First is this adorable banana charm I picked up at H&M last month. While I have a #shopsmall accessory list as long as my arm I couldn't resist this. £1.99? You're coming with me! 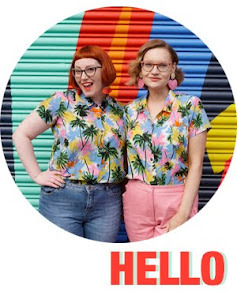 As my July wishlist says, I have tropical fruit on the brain right now as I'm Boss of Bridesmaids for my yellow-loving bestie Susan. 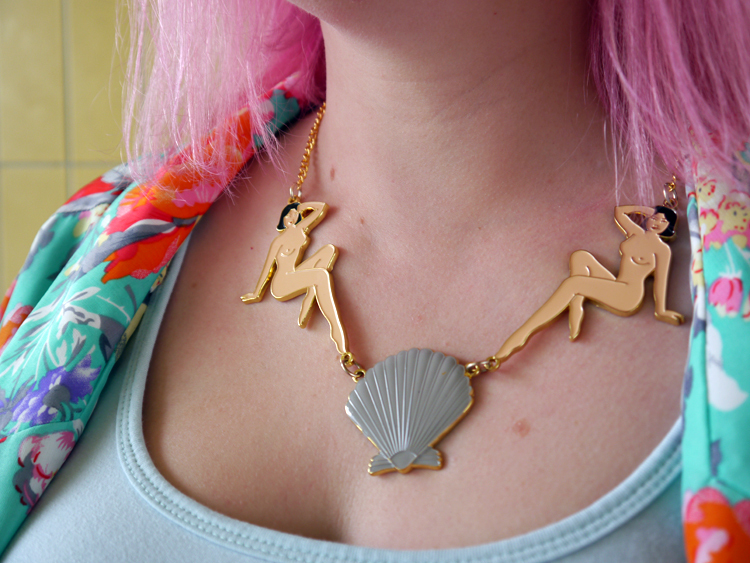 The other accessory is this Karen Mabon Shell and Show Girl necklace. I have coveted this necklace for ever, and consider it one of her staples, but I've always been put off because Helen already owns it. While I adore borrowing Helen's, I want to get more wear out of these bombshells, and I want them to be miiiiiine. So when Karen held a studio sale a couple of weeks ago, this beaut was in my hand before I even had a bubbly in the other. With all my interent shopping recently it's been a while since I've been in sale-frenzy mode but I could go ga-ga for Karen's scarves. I tried to shop smart, bringing cash with me to limit my spending but soon I was draped in silk like Cruella in spots. Scaaaaarves, all the beautiful scaaarves. I very nearly went home with a Coco Fennel number too, but the sizes left weren't on my side. That purchase is left for another day. Instead I went home with picnicking bears and a line of gymnasts. And these girls, of course! If you love a studio sale (and who doesn't?) I recommend you get on your fave designers' mailing lists. Everyone is doing them these days and I'm on a few, including The White Pepper, Dead Sleekit, The Rodnik Band and Covet among others. Better yet, get yourself down to a local maker's market to see the goods up close and personal. Yes we bleat on but it's so important to support great talent and I bet there's some near you.